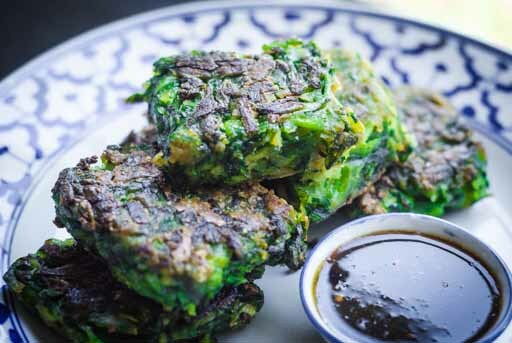 Fried Chinese Chive Cakes are a favorite snack that Thais inherited from our Chinese immigrants. 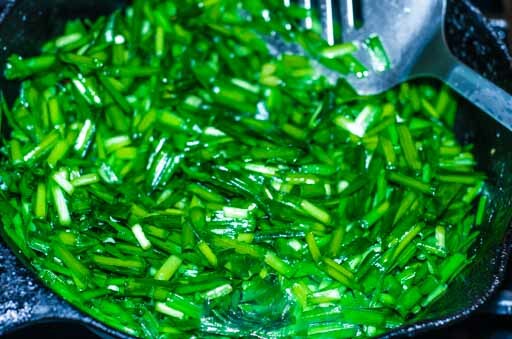 Fresh Chinese chives on their own do not have much flavor, but have a spiciness that resembles garlic. 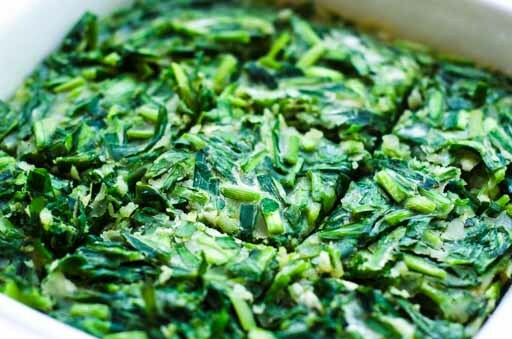 When stir-fried, the leaves transform into a tasty vegetable dish. 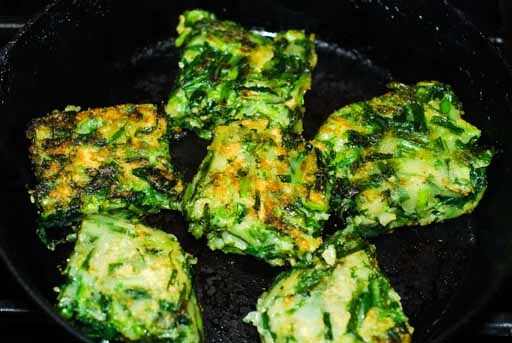 Combining the sauce, the crunchy fried cake exterior and the tender cake on the inside makes Fried Chinese Chive Cakes a hit. In Thailand, you see the same vendor offering both chive dumplings and chive cakes. 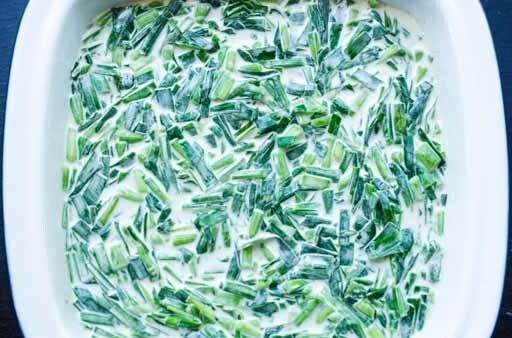 While the flavors are comparable, the Chive Cakes are so much easier to make. I personally prefer eating the cakes to the dumplings. No need to add garlic, the Chinese chives taste very garlicky already. Stir-frying the chives keeps the batter and chives uniform because the cooked chives don’t float up. For easier cutting, let the cakes cool down to room temperature. But it's hard to wait, so I cut them when they just came out of the microwave. You can see the jagged edges on my cakes. Wash Chinese chives well, removing yellow and wilted leaves. 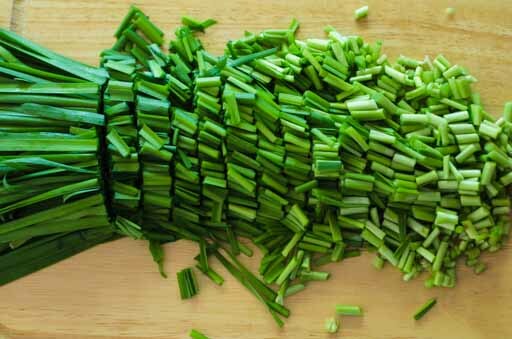 Cut the chives into ½ inch pieces (picture 1). For 1 pound of Chinese chives, I get 4 cups. Add salt, baking soda and 1 tablespoon of oil. Mix well (picture 2). 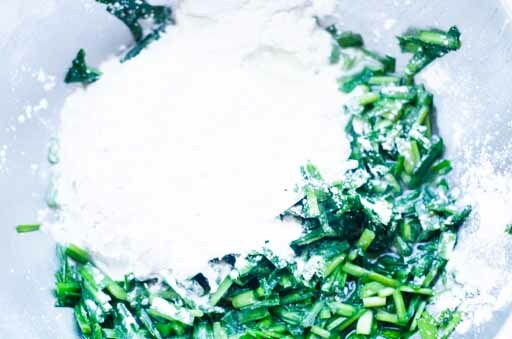 Briefly, stir-fry the chive mixture. Do not let it cook thoroughly. 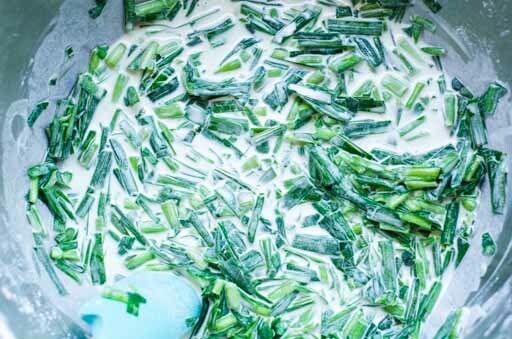 Mix the chives, rice flour, tapioca flour and water together to make a batter. Brush a 7.5 in. x 7.5 in. tray with oil to prevent the cake from sticking. Pour the chive and flour batter into the tray (picture 7). You can now either steam or microwave the batter to form the cakes. Steaming the Batter: Steam the batter for 12-15 minutes or until cooked. You can see the white batter turns somewhat translucent when cooked. Microwaving the Batter: Microwave the batter for 8-10 minutes. The batter will cook from edges toward the center. When the center of the cake turns somewhat translucent, the cake is done. If you choose to store the cake for later, you can refrigerate the cake for a couple of days. Otherwise, fry the cakes and enjoy! Frying the Cakes: Cut the cakes, while in the tray into 9 equal pieces. It should be about 1 inch in thickness. The size should resemble that of brownies. Remove the pieces of the pan and pan fry in oil. Use low to medium low heat to get the cake crunchy on the outside and soft on the inside (picture 8). It takes about 3-4 minutes to get the cakes to be crispy on the outside. If you're frying the cakes straight out of the fridge, it will take a bit longer. Serve hot with the sauce below. Add all ingredients together. 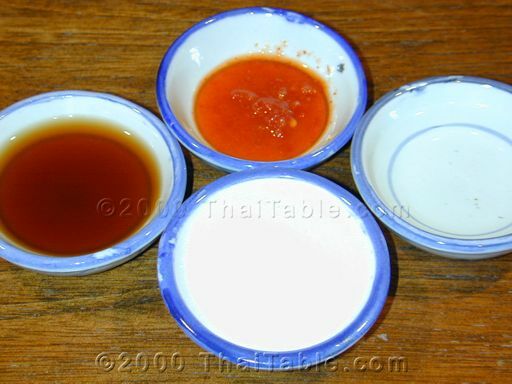 Chili garlic sauce can be substituted with fresh sliced green chilies (not the real small ones that are very hot). 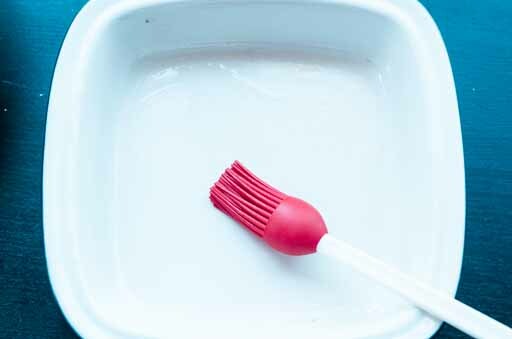 Serve in a sauce bowl.